Safely book the sweetest adventures on Earth. Getting a start-up going is a wild ride. It’s easy to forget how much you’ve accomplished. From a mention in news.com.au to Singapore’s Web in Travel feature. 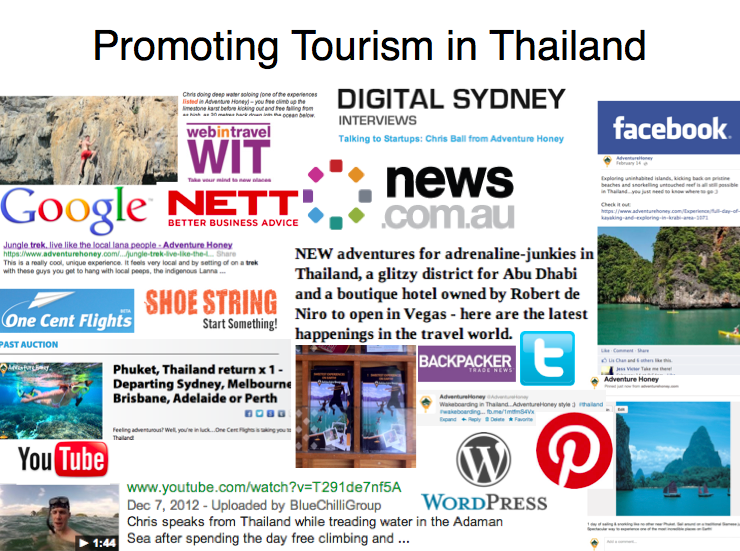 From business media in Australia with our Shoestring article to tech media in North America, we’ve been busily getting the word out about how AdventureHoney helps travellers find cool things to do in Thailand. PR has helped AdventureHoney get early exposure, generate credibility, and build off-page SEO links. We’ll continue to use it as we grow through Asia this year. 1. Know what you want. Sounds obvious, but very important that you’re clear what your objectives are and why it will add value for your business. 2. Include keywords (SEO) that consistently support the message you’re communicating wherever your customers might touch you (branding). 3. Try to provide broad interest. The best stories are often the ones where you pick out a general trend/illustrate a problem or opportunity and then subtly present your business as the solution. 4. Understand who you’re pitching to. With regard to the media you’re pitching, know their audience, know their style and write your News Release accordingly. Make it easy for them to work with you. 6. Have high-res pictures ready. A lot of journos will request them. 7. Short, puchy sentences and paragraphs. Don’t write a long winded essay. You want a sharp document with a series of soundbites that will jump off the page. Have you ever written a News Release? What has your experience been? ← What is the latest with AdventureHoney? Very good post. I will be going through some of these issues as well.